← Blown eggs–an easier way? Next I fill the hole back up again with sand. The sand keeps the eggs much cleaner, allows the rain to drain away from the nest, but still keeps enough humidity in the nest for a good hatch. The shelter then goes over the nest. 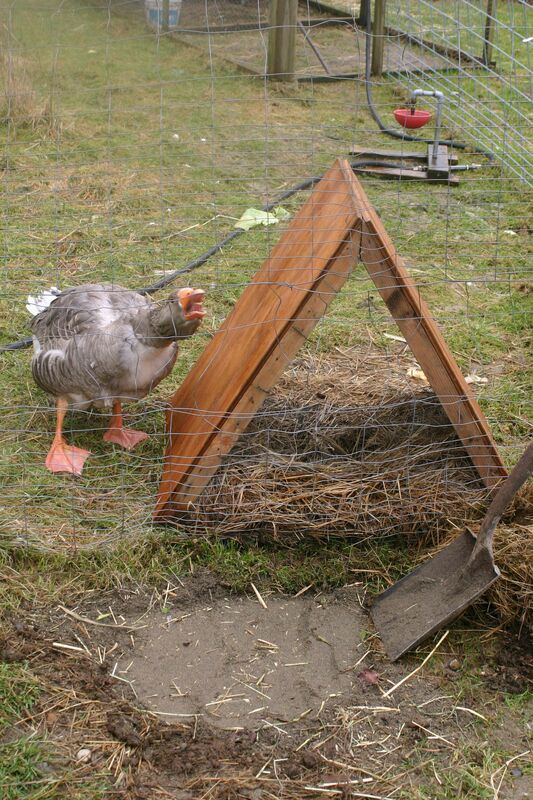 Although optional, I would want a shaded nest if I were a goose. She has to sit 31 days continuously in one spot, and I think a bit of shade and rain shelter is a big help for her. I orient the shelter so the nest can get direct morning and evening sun, but is shaded during the hot part of the day. Last is a good portion of dry hay or straw. I’m using hay this year because we have a couple bales that the cows & goats don’t like to eat. 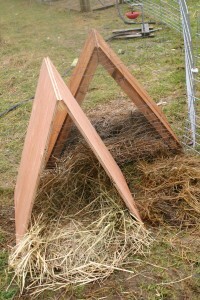 Straw nest in plastic doghouse: Too big, too flat, too dry, no person access, not enough air. Result: 0% hatch and the goose sat for nearly 2 months. I couldn’t reach in from behind the goose to candle or count the eggs. The eggs would roll out from under her and die from cold. The plastic prevented enough moisture from reaching the eggs. 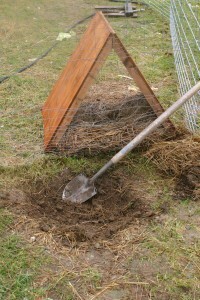 Growing goose eggs need a lot of air, and the plastic bottom also prevented that from happening. 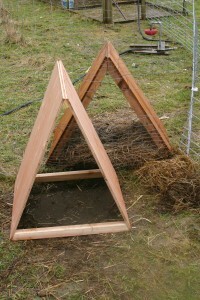 Shelter on sloped grass (i.e. I didn’t dig out a nest): Eggs like to roll downhill out of the nest, and after a month of sitting, this happens. Result: 0% hatch rate. Shelter on flat grass (i.e. I didn’t dig out a nest): Eggs get pushed out to the edge of the nest because the goose is round too. Eventually they linger outside of the nest and die from cold. Result: 0% hatch rate. Poor soil or inconsistent feed: Fertility is low resulting in 0% hatch rate, or eggs are lost due to thin shells. Don’t skimp on the feed when it comes to your animals–especially in the spring. Keep oyster shell out free choice for the goose–she needs her calcium & phosphorus. Free range gander: Some ganders like to wander allowing predators (raccoons & crows) to eat the eggs when the goose runs for a drink of water. Two nests with a trio of geese (1 gander + 2 geese). 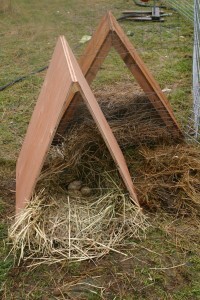 One of the nests will be the favorite, and both geese will use it. Problems arise when one goose begins sitting and the other keeps depositing eggs. 2 geese can fit into even a tiny nest box. Result is 1 of 2 options: #1 constant diligence by the farmer to remove good eggs results in an acceptable hatch by only one of the geese. (The second goose gets gosling envy and stops sitting early.) 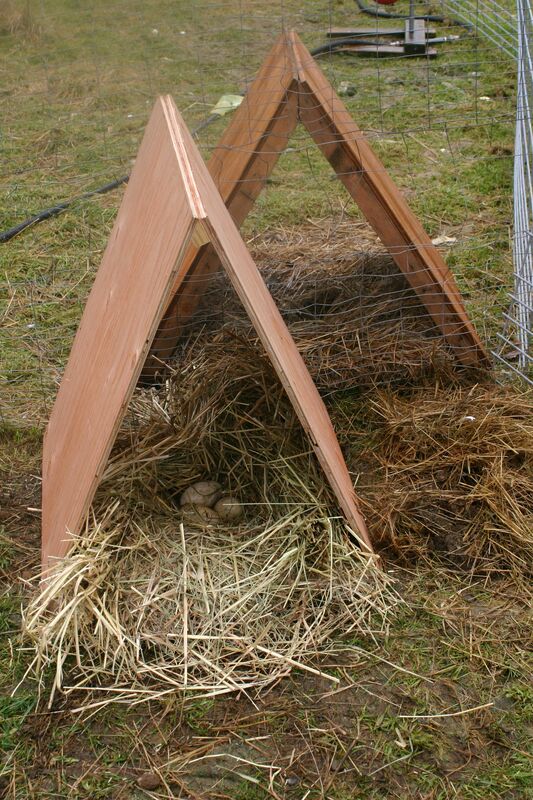 OR #2 The first goose nest gets over populated w/eggs resulting in a 0% hatch rate. Good nest with flock of geese & ganders: The ganders fight, and fight, and fight–day & night. Some female geese get too much male attention while others are neglected. Result: Nest confusion (see above), low average fertility, and a poor hatch rate. Don’t bother to candle the eggs: We had a goose who sat on an empty nest because we pulled the eggs just before she began sitting. After 35 days I finally checked to realize that there was nothing under the bird! Some birds will not have fertile eggs. If you check early on (after 7 days), you can see if the eggs is growing. Infertile eggs can be swapped out from under the goose and you give your broody goose a successful spring. 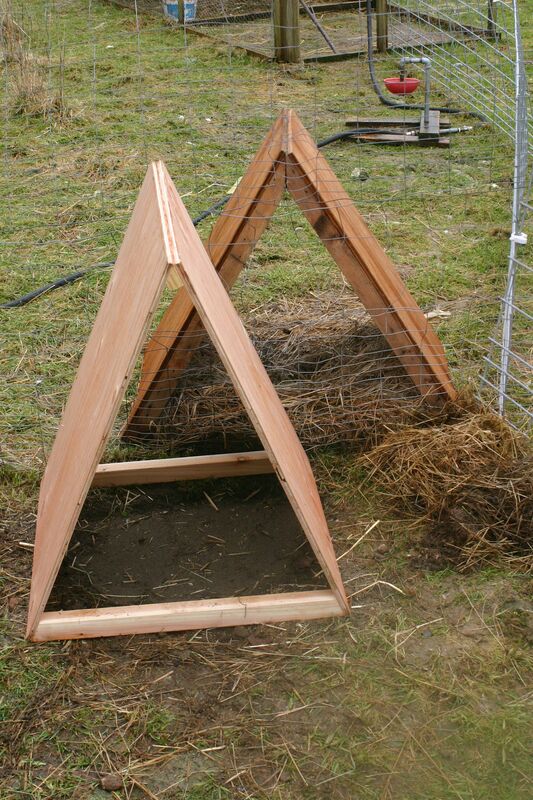 Incubator hatching: It takes 31 days to hatch a goose egg, and it can be done in an incubator. Follow the book to the letter on temperature, humidity, & fresh air access curves (yes, it changes over that 31 days). Remember to mist the eggs daily and rotate them 2-3 times per day. 50% hatch rates in an incubator are normal, and a 10% hatch rate is common. Brooding & gosling care fall to the farmer after successful hatches. This entry was posted in Farming, Geese and tagged Geese, natrual nesting. Bookmark the permalink.